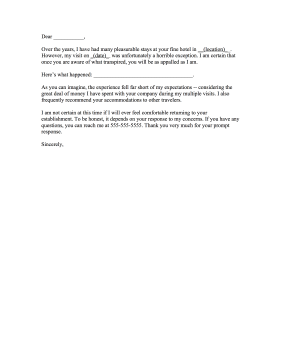 Hotel complaints can be filled into this customer service and accommodation complaint letter. Over the years, I have had many pleasurable stays at your fine hotel in __(location)__. However, my visit on _(date)_ was unfortunately a horrible exception. I am certain that once you are aware of what transpired, you will be as appalled as I am. As you can imagine, the experience fell far short of my expectations -- considering the great deal of money I have spent with your company during my multiple visits. I also frequently recommend your accommodations to other travelers. I am not certain at this time if I will ever feel comfortable returning to your establishment. To be honest, it depends on your response to my concerns. If you have any questions, you can reach me at 555-555-5555. Thank you very much for your prompt response.